Choose the Lanier MP 2501SP for fast, dependable and affordable multifunction performance to streamline document-related workflow and lower your total cost of ownership. This space-saving and innovative MFP combines quality printing and copying on media up to 11" x 17", easy-to-use scanning capabilities, optional faxing and advanced security features. For small offices, use it as your primary system, or deploy it as an integral part of a Ricoh Managed Document Services (MDS) strategy and improve productivity for small workgroups throughout your organization. With a warm-up time of only 20 seconds or less and first-print times as fast as 6 seconds, the MP 2501SP is ready to move as fast as you are. The compact and reliable system produces high-quality output at up to 25 pages per minute. Full-front-access design allows users to connect to key functions effortlessly for easy operation and maintenance. Plus, with its powerful processing engine, the system can manage multiple copying, printing and scanning projects for continuous workflow. The MP 2501SP offers portable and Cloud-based applications to meet the evolving demands of today's mobile workforce and to share information throughout your organization. With a built-in USB/SD card slot on the control panel, workers can print PDF, TIFF and JPEG files right at the device - without additional drivers or software. (Requires HDD option). Printing of e-mails, photos, web pages and documents can also be initiated from smartphones and tablets without software to download, drivers to install or cables to connect. Take advantage of the easy-to-view, tiltable 4.3-inch color control panel with a customizable home screen and icons for personalized, one-step shortcuts to common tasks. Choose from three available function keys to assign other pre-set tasks for even more convenience. Plus, the control panel includes a home screen button so users can return to the main menu instantly. 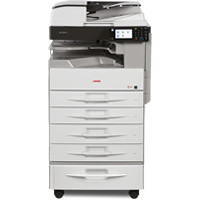 With standard printing and copying, the versatile system offers 600 dpi image quality output along with advanced scanning features and optional fax capabilities in a compact design, making it ideal for everyday workflow in small offices and workgroups. Use enhanced batch scanning to scan one-sided and two-sided originals in a single job without generating unnecessary blank pages. With the fax option, users can route documents directly to e-mail accounts or shared folders and send faxes using the Internet instead of phone lines to reduce costs and enhance productivity. In addition, with the Remote Fax feature, an organization can designate one MP 2501SP with fax capability as the hub to send and receive documents from other networked Ricoh services-led MFPs without fax capabilities. The Ricoh MP 2501SP allows you to scan black-and-white and color documents and save them instantly to shared folders, computers, media cards and more at no additional cost. Color scanning preserves the original look of the document, enabling the capture of highlights, annotations and other image details. Users can also look at thumbnail previews of the scanned documents to ensure quality and accuracy before they are distributed. With optional Ricoh GlobalScan NX software, users can create unique scanning workflows that automate distribution and minimize manual errors to streamline the way your office shares information. The MP 2501SP is designed to deliver a wide range of documents on media up to 11" x 17". It comes standard with a 100-sheet capacity automatic reversing document feeder (ARDF) to handle multi-page originals for single or two-sided copying and scanning. With the optional hard disk drive (HDD) installed, the Ricoh MP 2501SP offers user password-protected and user-specific authentication to ensure only authorized users have access to key documents and system privileges. Print jobs can be stored at the device until users swipe an ID card or enter ID information at the control panel to release them. The DataOverwriteSecurity System (DOSS) ensures latent images stored on the internal HDD are protected. For even greater security, it includes AES 256-bit/SHA-2 enhanced encryption for advanced protection of your most critical data. The MP 2501SP can save more electricity by shortening the time it takes to recover from its "1W" Sleep Mode to only 10 seconds. The system offers automatic duplexing for copying, faxing and printing to reduce paper consumption. An Eco-friendly Indicator is prominently displayed on the control panel to encourage users to be more environmentally responsible. It displays the print history for each user as well as the subsequent impact on the environment. Connectivity is easy in any shared-use office environment with a standard Gigabit Ethernet or USB 2.0 interface. Take advantage of Ricoh's Embedded Software Architecture and incorporate customized applications and software solutions to boost productivity and reduce operating costs. Incorporate innovative print driver deployment, automated meter collection, Cloud-based fleet reports and more. In addition, Web Image Monitor allows users or administrators to check status or configure settings of the device through any web browser.